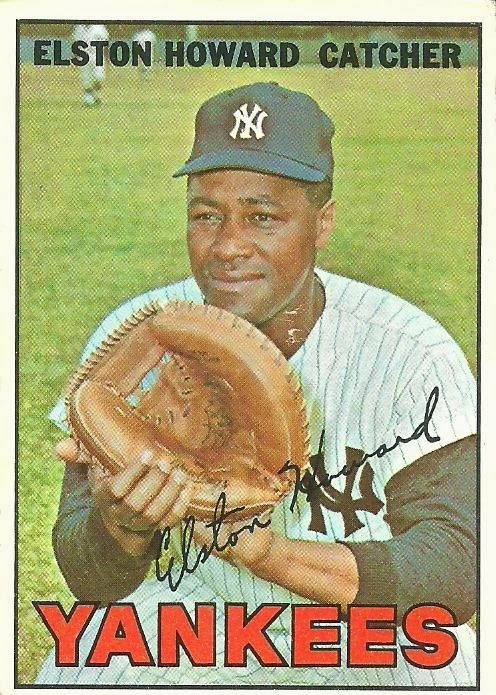 There are certain cards that I feel are just made to be signed. 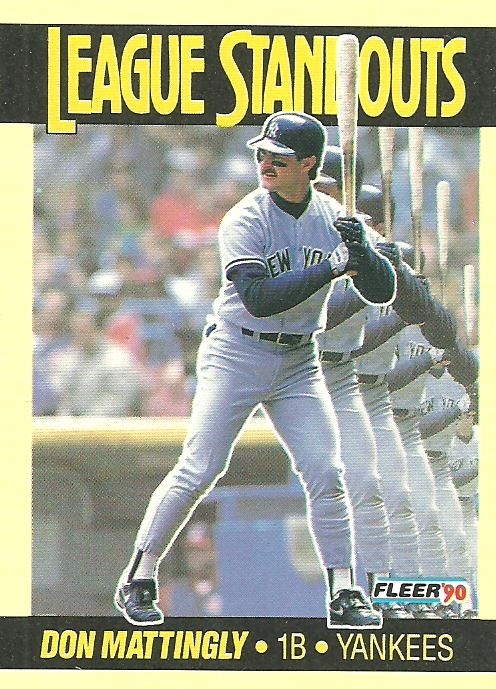 This Fleer Greats of the Game card is one of them. 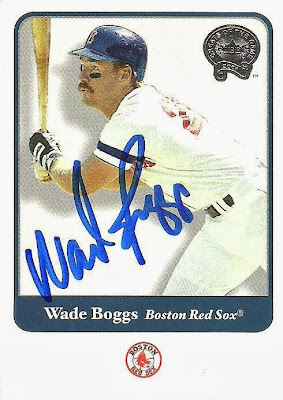 In fact almost all of the Fleer Greats of the Game cards look awesome signed. 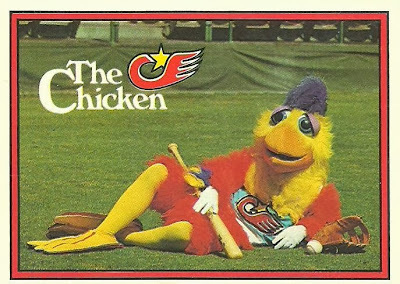 I'm not sure when I sent this card out, but I got it back this past Friday. On Friday my wife and I went to the Diamondbacks game. 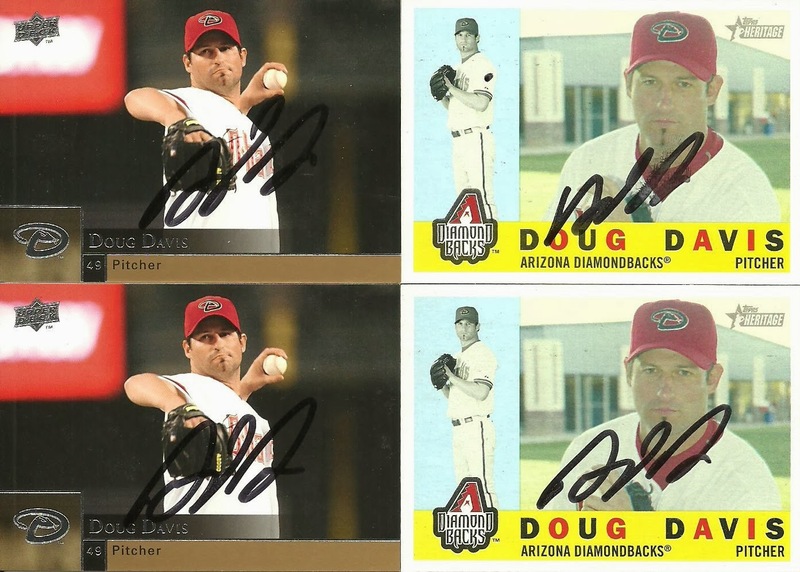 The Arizona Lottery had a promotion a week before where if you bought a $10 scratchers ticket you got two free tickets to the game and a meet and greet with D-Back alumni. 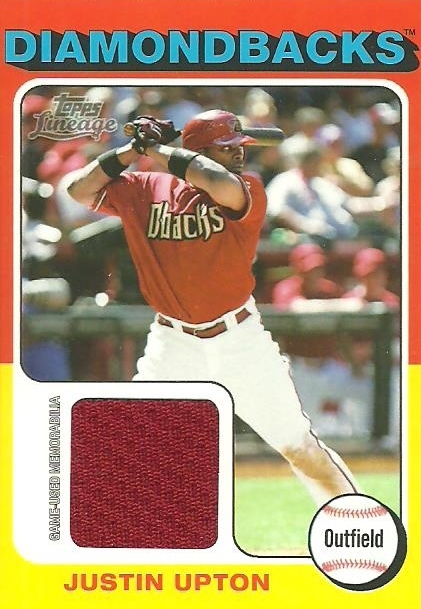 After buying the scratchers ticket (paid $10 and won $15) and getting my D-Backs tickets I saw fellow blogger, Moe of the blog My 2008 Topps Set Blog, in line. He told me that he had emailed and asked which D-Backs alumni would be there. 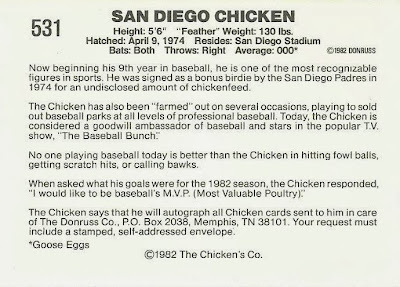 He said that it would be Augie Ojeda and Doug Davis. A big thank you to Moe for that and also for pointing out at the event that our tickets were each loaded with $10 in D-Bucks that could be used for food or merchandise at the ballpark! I'll show off what I got with the D-Bucks on a different post. It was great knowing who was going to be there so I could find some stuff. 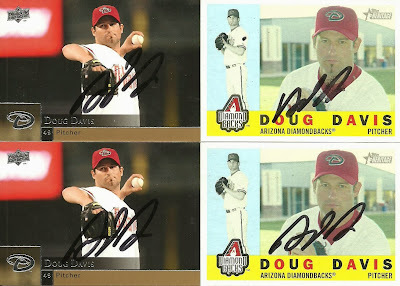 Augie Ojeda doesn't have a lot of cards in the first place and I had met him last month at a different promotion, so I didn't have anything else for him to sign, but I was able to find some Doug Davis cards, 23 Doug Davis cards to be exact. 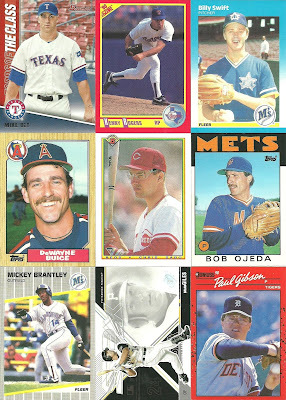 Now I know what you're thinking.....there are only 22 cards below. Well I didn't want to have one card all by itself and it was another of the O-Pee-Chee cards, so I felt like it was okay not to include it. 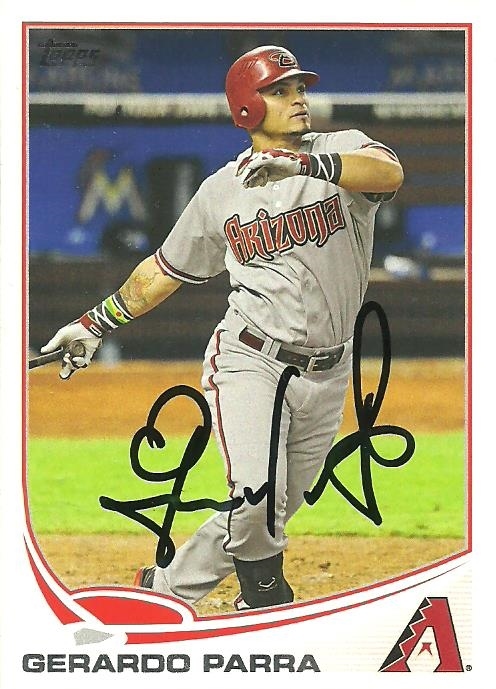 You might also be thinking that having someone sign 23 cards all at once is a bit much. I know. I'm obsessed. I can't deny it. 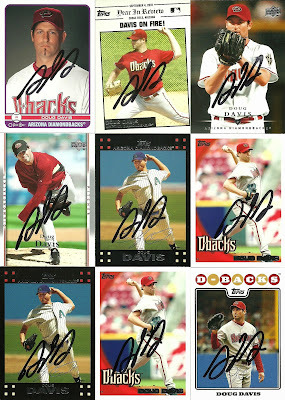 I just love getting autographs. 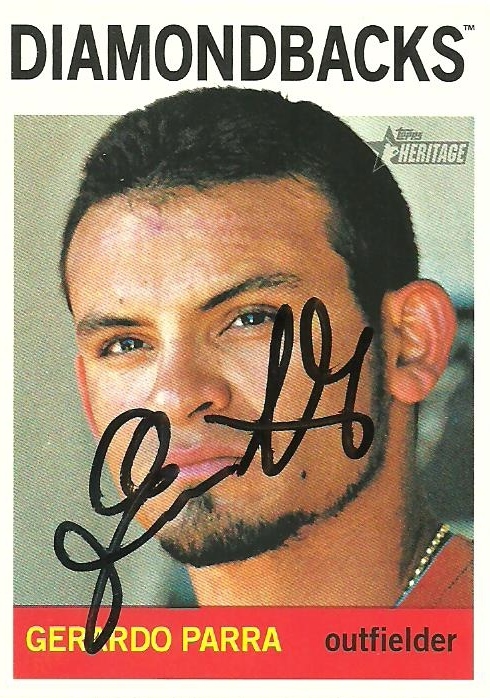 I don't sell any autographs that I get. 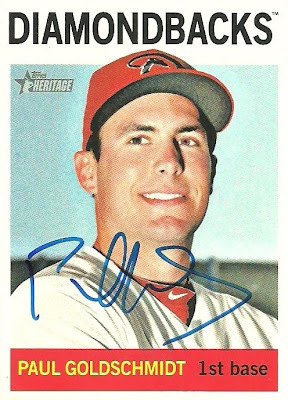 I don't really even like to trade autographs that I get in person. For me it is about the experience. 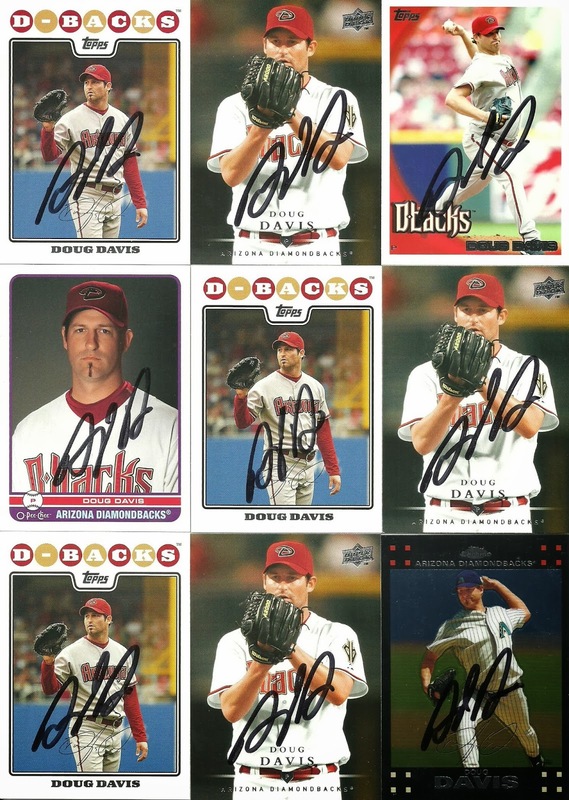 When I met Doug Davis I told him that I had brought a bunch of cards, but told him I would be fine with however many he wanted to sign. He was super nice and said he would sign all of them. 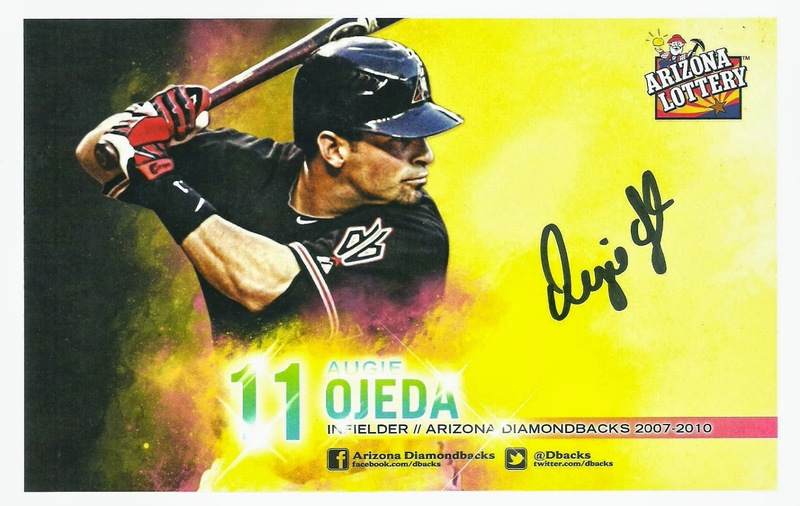 Here are the pictures that were provided at the event, which are very similar to the other photos that the D-Backs have been using this year but are yellow and have the Arizona Lottery logo one corner. I guess there's no crying in baseball.... unless you break a record that has stood for over 50 years. 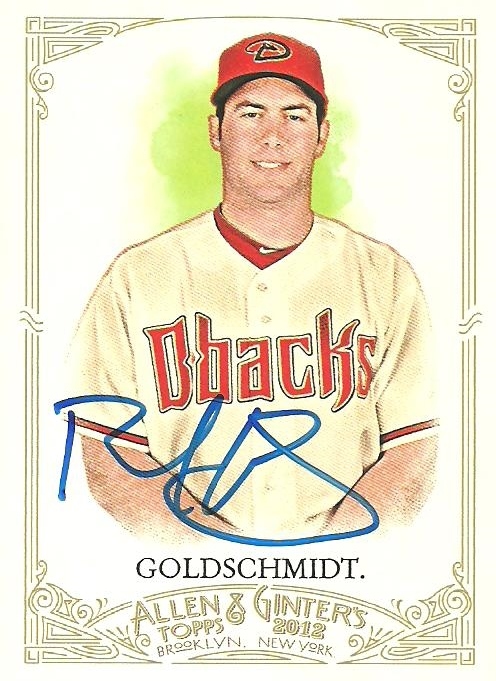 I got this ttm success back from Goose Goosage just over a month after I sent it out. It is my first Hall of Fame player for my First Night Game at Wrigley Field Project. It looks like it was signed with a fine tip marker and his first name either bubbled or part of it came off a little bit. 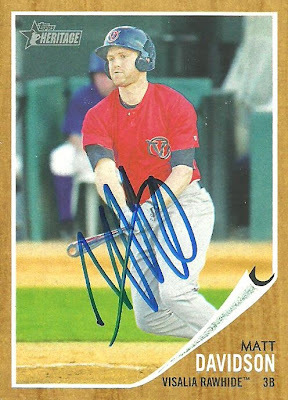 I might send another card to him with hopes of a better looking signature, but I'm happy with this one in the meantime. 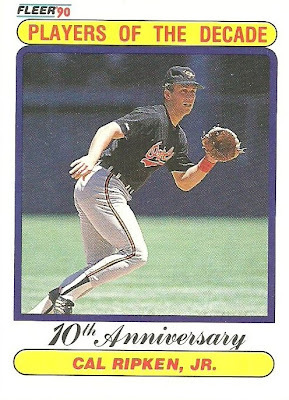 So I picked this card up out of a dime box recently at my LCS. I don't remember ever seeing it before and I thought it was cool. 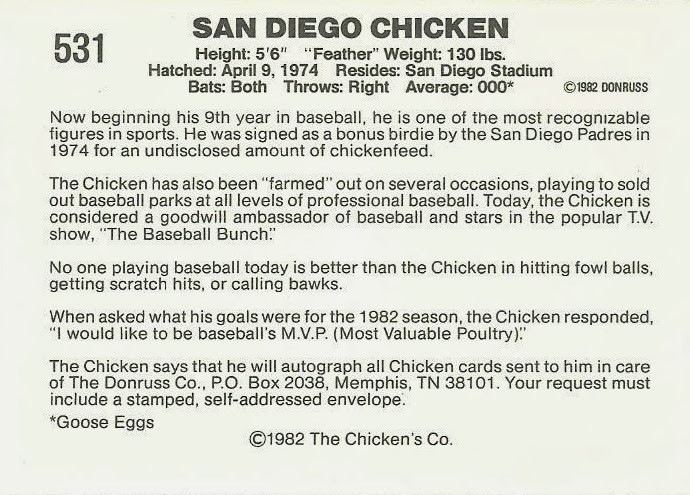 After reading the back I had to google "The Baseball Bunch". I had no idea that the tv show ever existed as I was too young when it aired, but it sounds awesome! Anyone remember watching it? 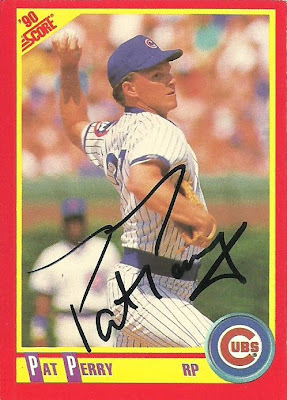 Also, I thought about sending the card off to the address provided for an autograph just to see what would happen, but after doing a little research I found a current address, so I might send it there. I picked up these two 2013 Topps Tribute Wade Miley jersey cards from the same seller recently off eBay. The base card is numbered out of 99 and the blue parallel is numbered out of 50. With combined shipping it was less than $5 shipped for the pair. 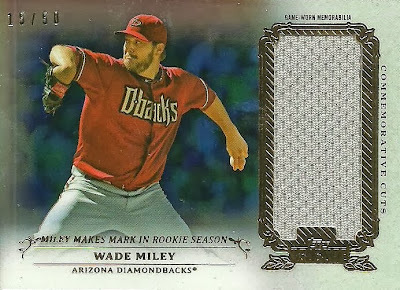 Miley had a great rookie season in 2012, but calmed down a bit this season. 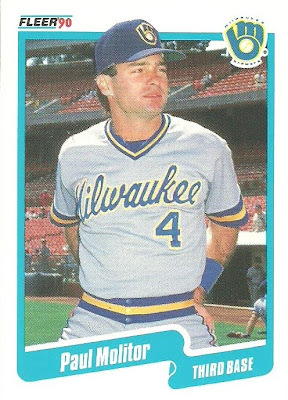 To me he seems to struggle first couple innings and then calm down before struggling again in the 6th. eBay Pick-Up: 1999 Fleer Travis Lee Damage Inc. 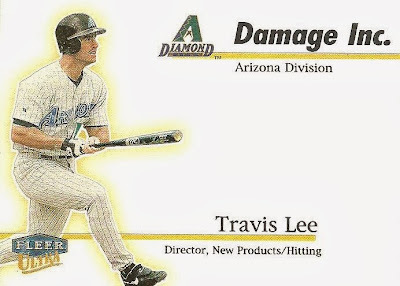 I picked up this 1999 Fleer Damage Inc. card of Travis Lee recently off eBay. I paid just under $4 for it. 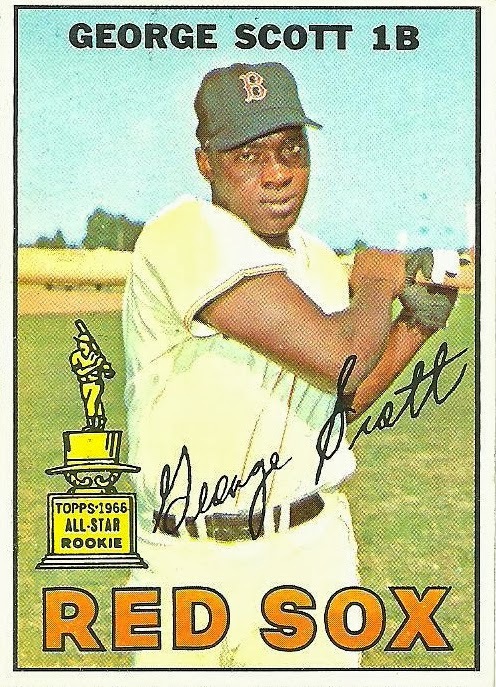 I've always liked, although never owned any of the Damage Inc. insert cards. They are made to look and feel like a business card. I picked up this 2009 Bowman Sterling autographed card of A.J. Pollock off eBay recently for just under $3 shipped. Pollock is a great fielder, but I would love to see him get on base more. 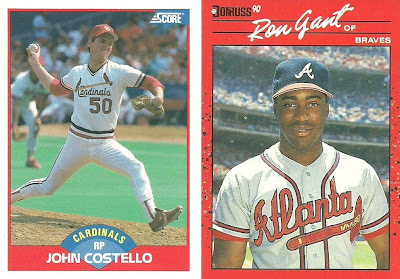 There has been lots of talk lately about what the D-Backs outfield will look like next year. 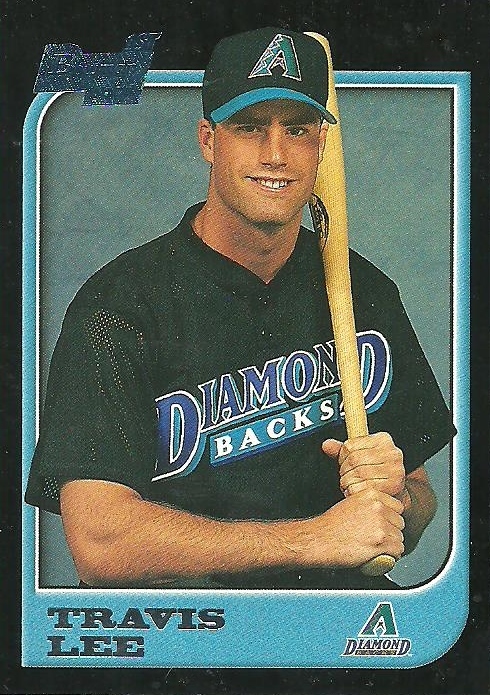 Most of what I hear has Pollock as the D-Backs fourth outfielder, but we'll have to wait and see. 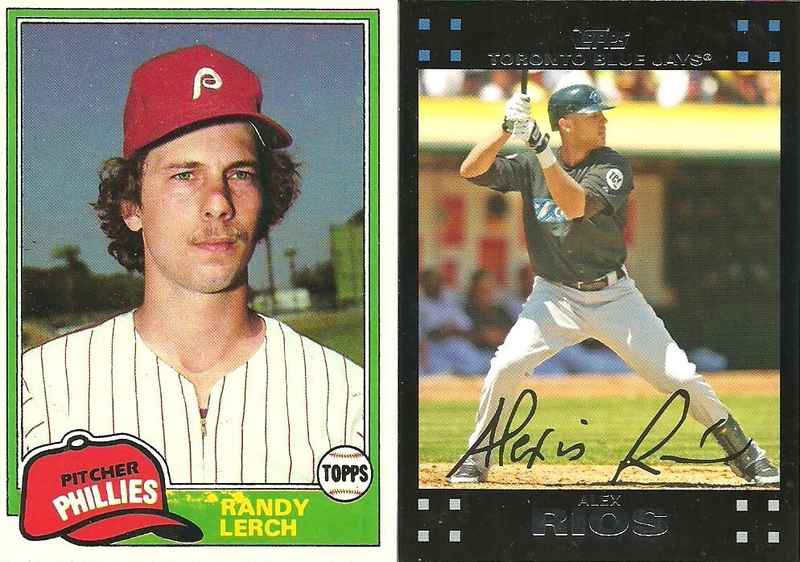 I picked up this trio of 1967 Topps cards from my LCS a while back. 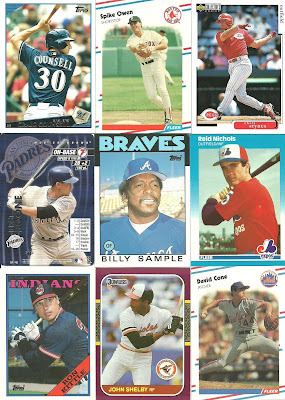 The cards were $2 each, but then 20% off, so I spent $1.60 apiece. 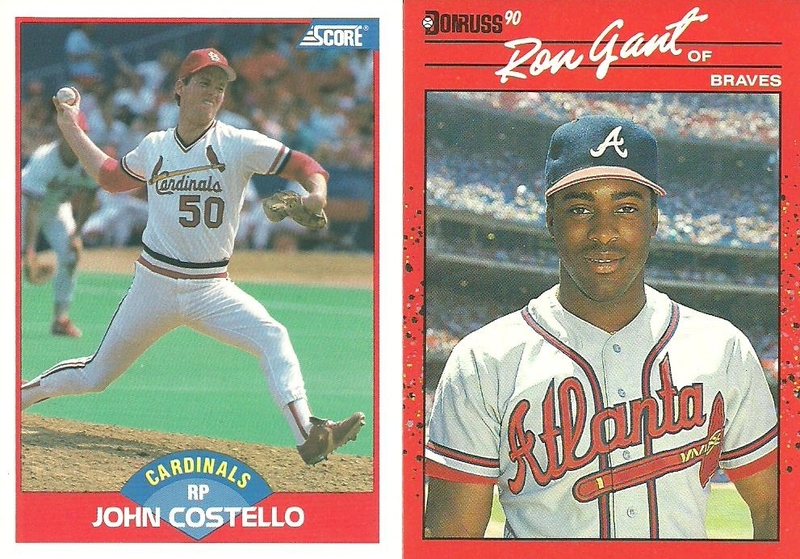 While none of them are Hall of Famers, each player had quite a career. 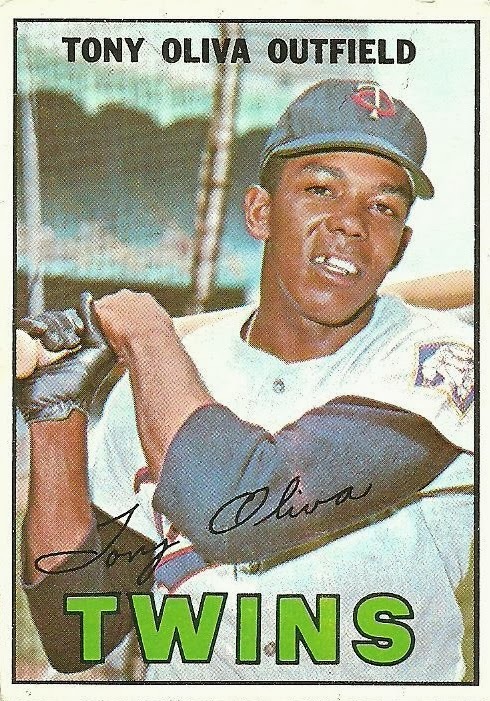 Tony Oliva was the 1964 AL Rookie of the Year. 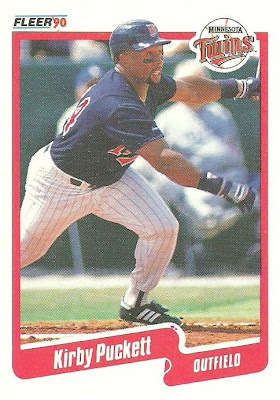 He was the AL batting title 3 times and was an 8 time All-Star. George Scott was a 3 time All-Star, won 8 Gold Gloves at first base, and led the American League in Home Runs and RBI in 1975. 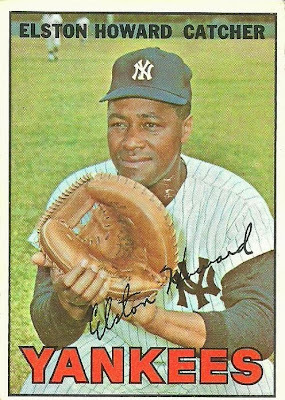 Elston Howard won the 1963 AL MVP, was a 12 time All-Star and won 6 World Series titles with the New York Yankees. My oldest son and I went to the Diamondbacks game this past Wednesday. 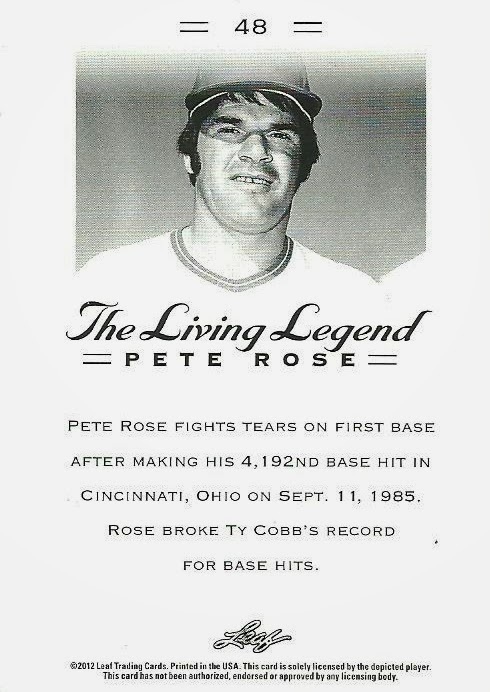 They played the Dodgers. 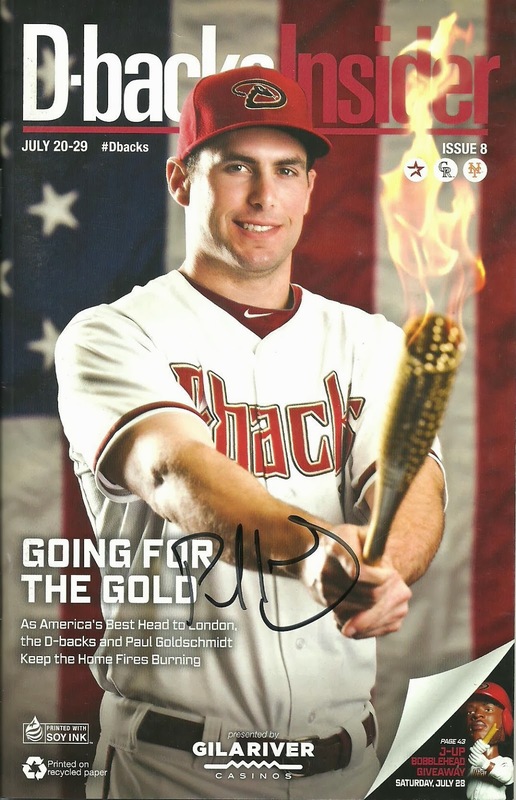 The D-Backs won. The next day the Dodgers won and celebrated in the pool in right field. I'm not super upset like some people, but I do think it was planned and that it was meant to be disrespectful. That's all I will say about it. Paul Goldschmidt signed this D-backs Insider magazine from last season for me right before the game started. Adam Eaton gave my son a ball and so he had Goldschmidt, Gerardo Parra, and A.J. 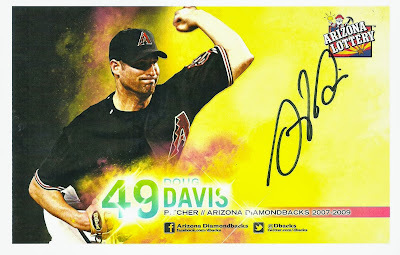 Pollock sign that ball and then he got Matt Davidson on his 2013 team ball. I picked up this 2004 Playoff Honors Brandon Webb autograph off eBay recently for less than $3 shipped. It's serial numbered on the back 086/100. 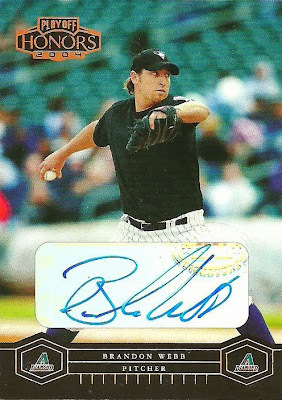 This is my 265 different Brandon Webb card. I picked up this 2004 Donruss Classics Significant Signatures Autograph of Steve Finley for just under $4 shipped off eBay recently. 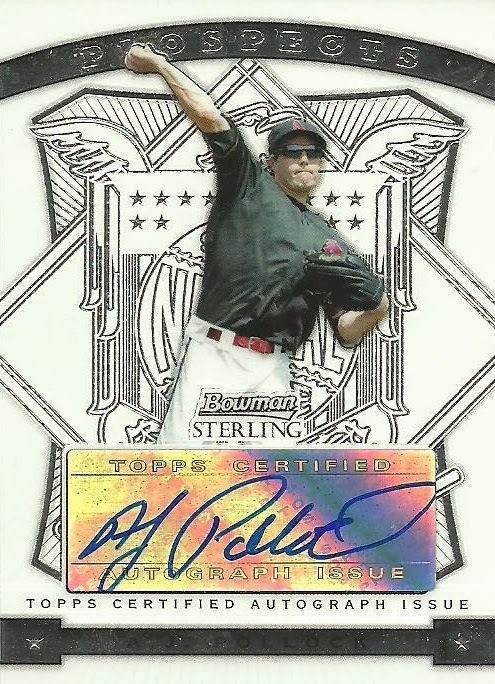 It's serial numbered on the back 014/100. 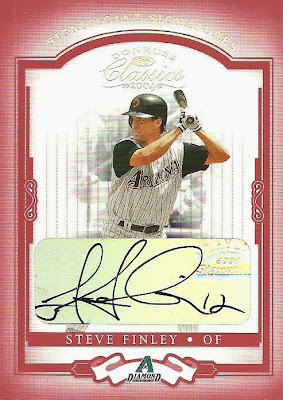 I'm starting to get a nice collection of game-used and autos of Steve Finley. He was always a favorite of mine when he was with the D-Backs and he was really nice at the Alumni Game earlier this month. 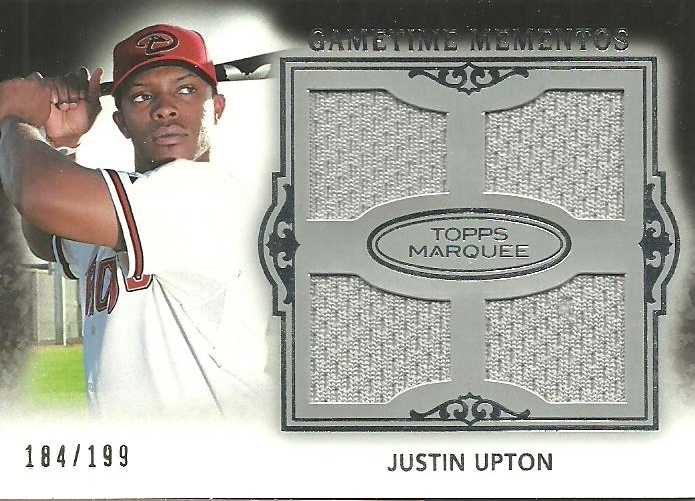 I bought a 4 card lot of Justin Upton recently on eBay. 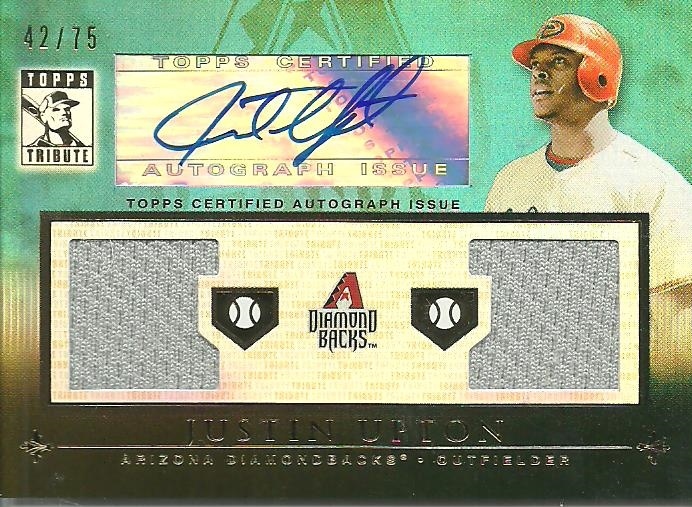 All the cards feature Upton as a Diamondback and I feel like I got a pretty good deal. In fact, when he was with the Diamondbacks I paid around the same amount for just an auto as I did this 4 card lot. I got the 4 card lot for $23 shipped. I got two cards back from Pat Perry on 9/11/13. 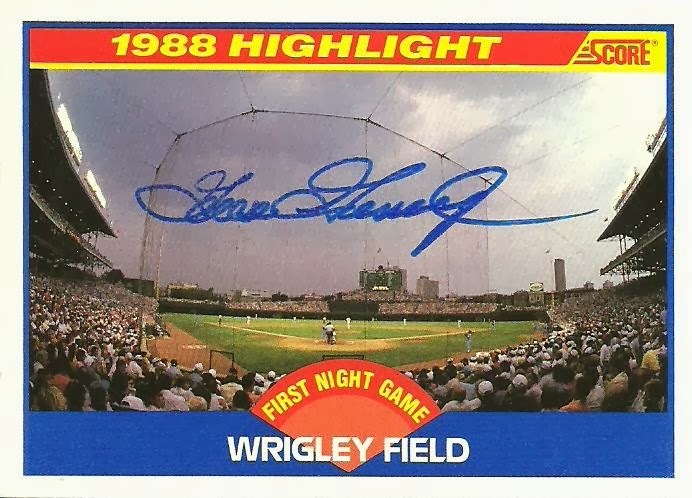 One was for my First Night Game at Wrigley Field Project and the other is a 1990 Score card. 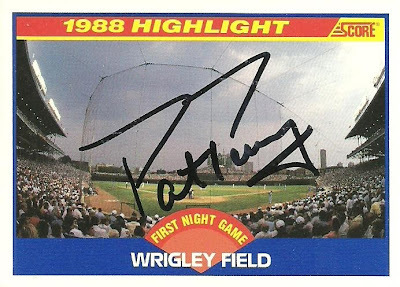 Pat is the first to sign the Wrigley Field card in black and he signed it nice and big right in the middle. After getting the Miguel Montero bobbleheads at the game Saturday night we headed down to the field to try to get a good spot for autographs. As we were walking up Tony Campana was signing but we didn't have anything for him to sign and he left shortly after we got there. We did meet up with Joe, from the blog Catching Rays!, and had fun hanging out with him for a while. Later on, during the game, I met briefly with Adam, from the blog Thoughts and Sox. We ended up waiting about two hours, but after the National Anthem, Paul Goldschmidt came over and signed a couple cards for us. 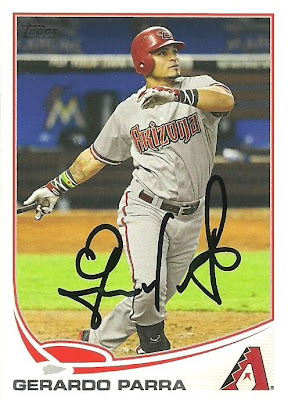 Gerardo Parra came over as well and signed two cards for us. 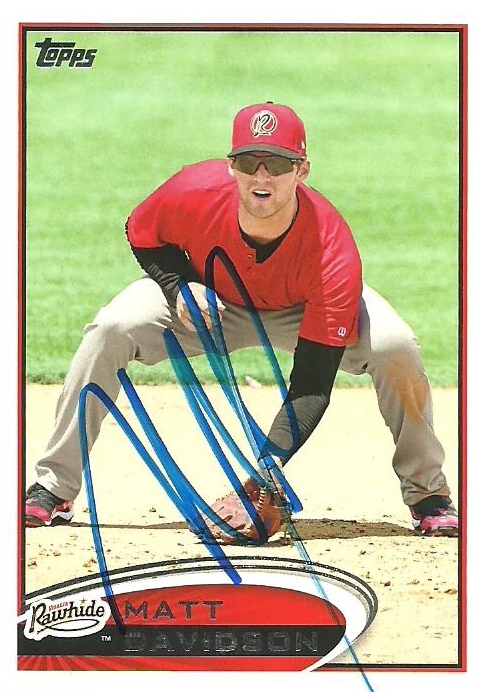 Next, Matt Davidson came over. He signed two cards for us as well. Then Adam Eaton came over and let my oldest son take the ball out of his glove, but he didn't sign for anyone. Didi Gregorious also came over and since we didn't have any cards for him to sign my son got him to sign the ball that Eaton had given him. 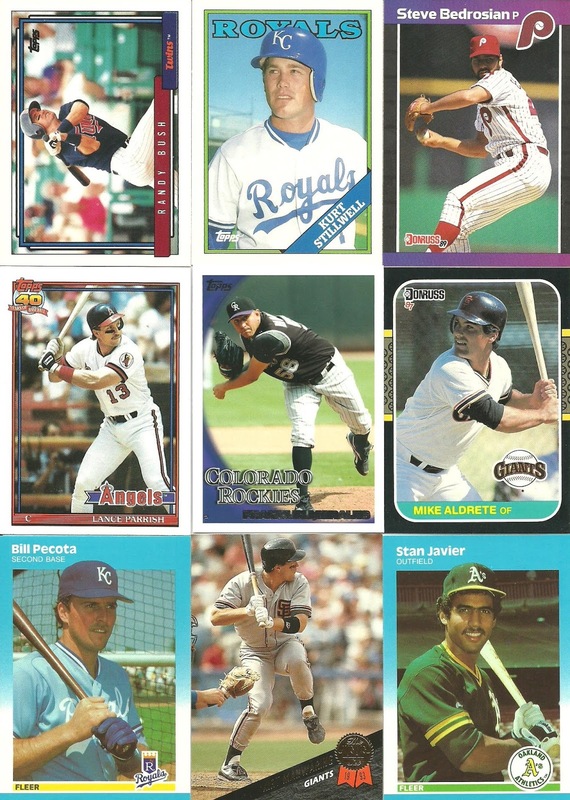 When I was growing up my Dad would buy baseball cards and then when I would help him with stuff around the house he would pay me in baseball cards. Several years ago he said he was going through some stuff and found a pack of baseball cards that hadn't gotten used. 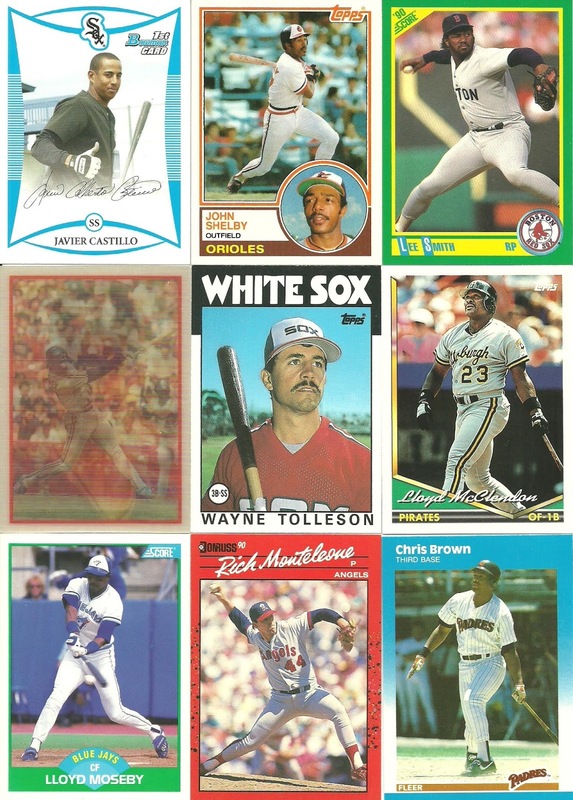 It was a 1990 Fleer rack pack. He gave it to me and I kept it unopened. last week I came across it and decided to open it up. There was one League Standouts insert and a few Hall of Famers. 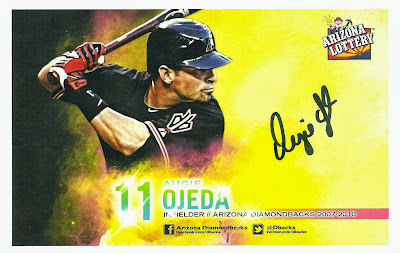 Yesterday was Hispanic Heritage Night at Chase Field as the Arizona Diamondbacks took on the Colorado Rockies. 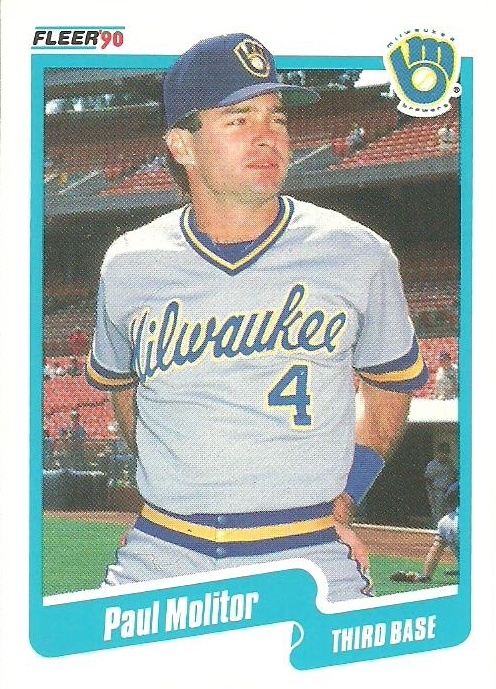 In connection with the event it was Miguel Montero bobblehead day. I took my two oldest boys and we arrived at the stadium about 2 hours before game time just as the gates were opening and got our bobbleheads. This is my 34th D-Backs bobblehead in my collection. There have been 56 total, not including variations, so I need 22 more. 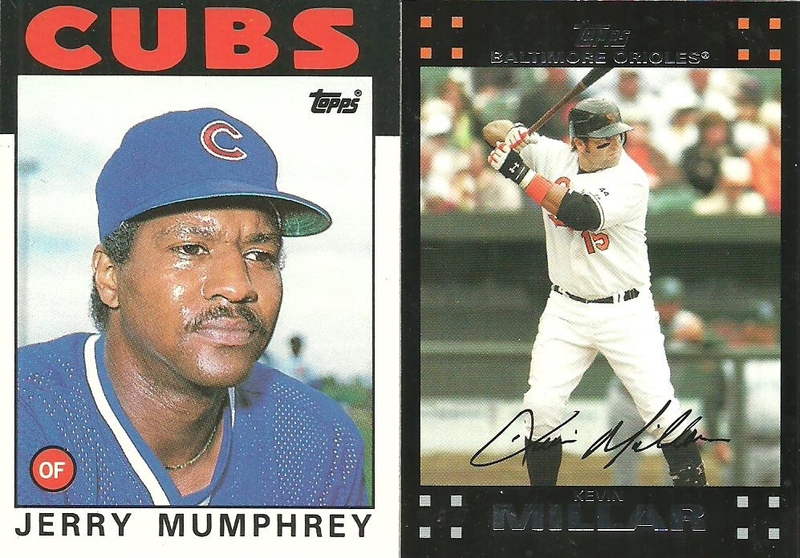 I had to go to Dollar Tree a few weeks ago for something and while they didn't have what I needed, I grabbed three repacks of baseball cards. 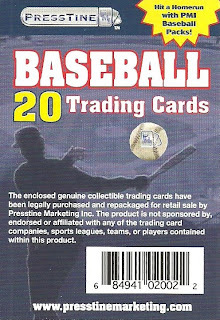 20 cards for $1, or a nickel a piece. Not bad, although I have plenty of cards I would gladly sell for a nickel a piece, so why am I buying more? Oh well. Here's what I got. 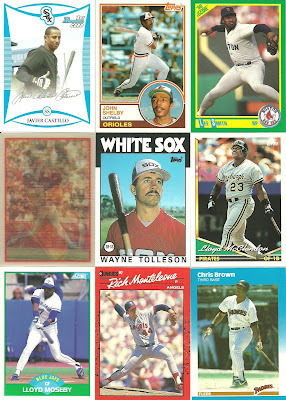 Pack #1 - Not much in this one besides memories of 1989 and 1990 Donruss, 1987, 1988, 1991 and 1992 Topps and 1990 Score. The 1981 Topps card of Randy Lerch was the oldest card I got from the three packs. I found it interesting that a lot of the cards are from Traded or Updates sets like the 1986 Topps Bob Ojeda, the 1988 Topps Kurt Stillwell, and 2 out of the 3 1987 Fleer cards from this pack. Pack #2 - I bought this one because of the Javier Castillo card. I'm a "thumbs up" guy. Lee Smith was dominant. 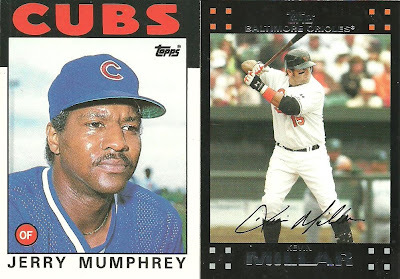 The Lloyd McClendon and Lloyd Mosbey cards were back to back which I thought was strange since Lloyd isn't a common name. 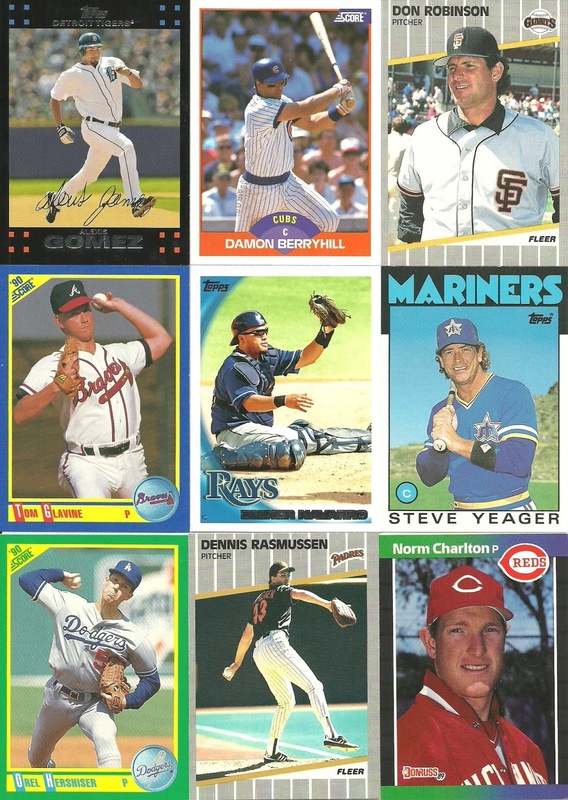 The Will Clark Score Dream Team card is nice. 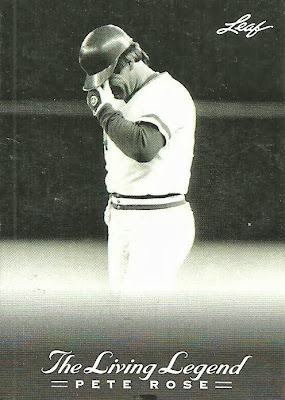 Pack #3 - I bought this one because the Craig Counsel card was showing and it shows his unusual batting stance that I grew accustomed to while he played here in Arizona. 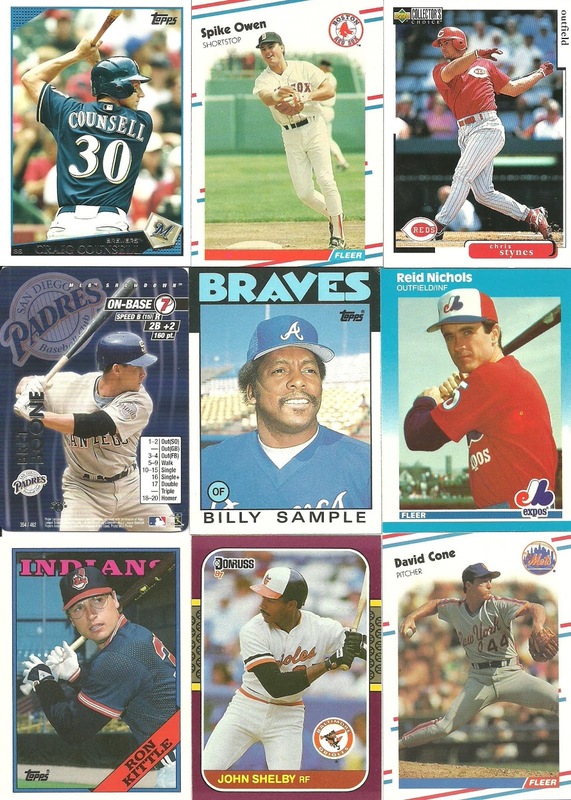 The card of Glavine appears to be the only card of a Hall of Famer or future Hall of Famer out of the three packs. In my last post I was upset because of an eBay auction. 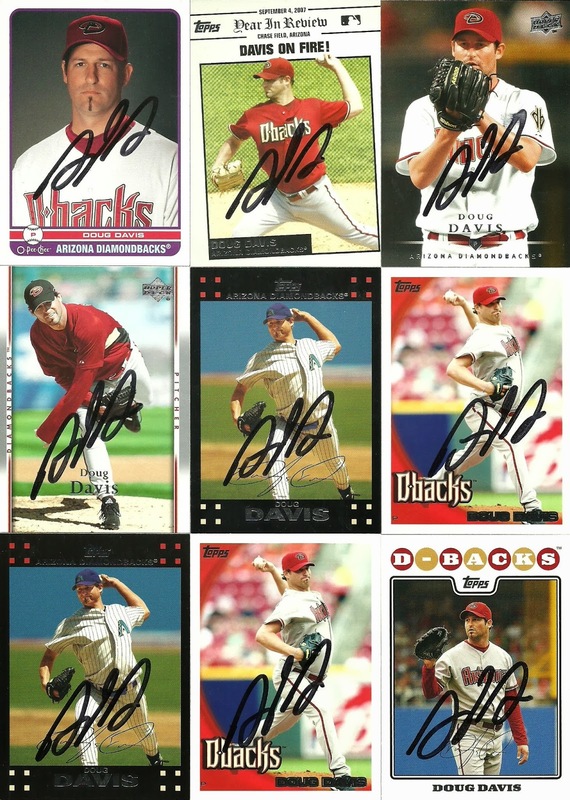 I purchased these three Travis Lee cards for $0.99 with Free Shipping. The auction showed them in screw down cases and the description stated that "all three cards were in screw down cases". 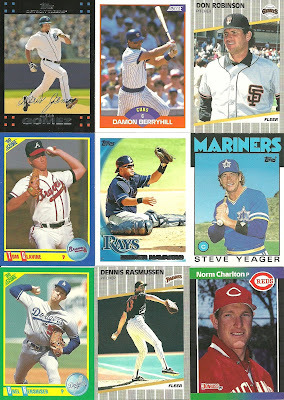 The cards arrived in a pwe in top loaders with no penny sleeves. I asked if I had a right to be upset. I got a lot of responses. I wanted to share my thoughts on the matter. For me it wasn't about the screw down cases. 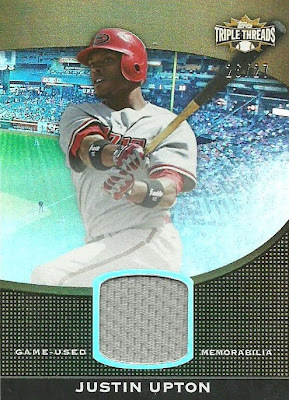 It was the fact that the seller didn't put them in penny sleeves before putting them into top loaders and then shipped them in a pwe. 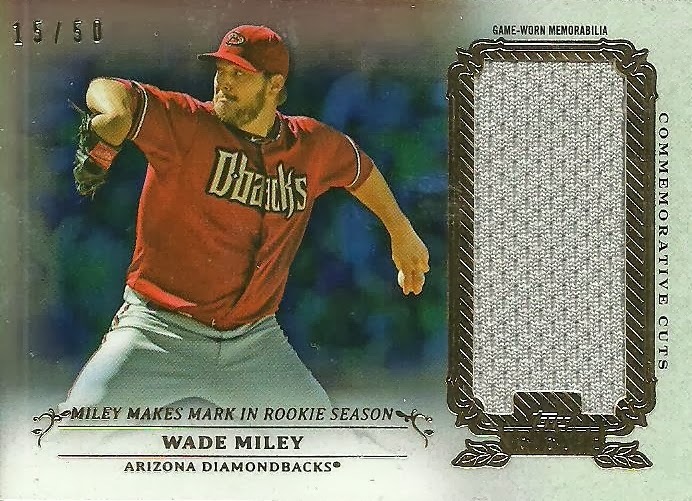 The cards ended up being fine, but it bothers me that just because someone didn't get as much as they hoped for on an auction, they cut costs and risked the condition of the cards. 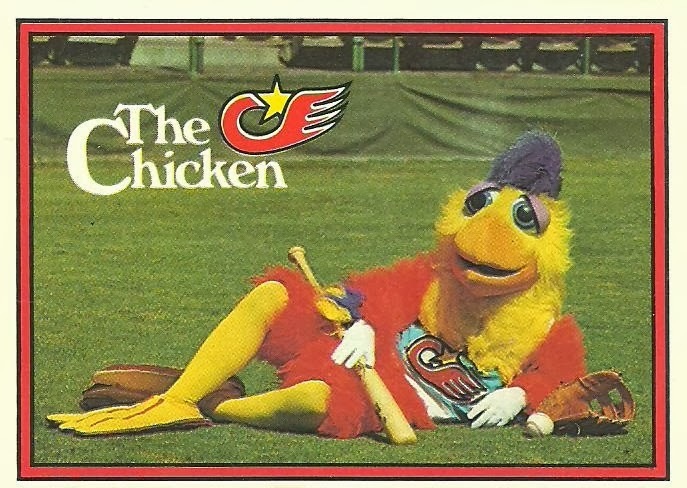 Now let me talk about the cards. 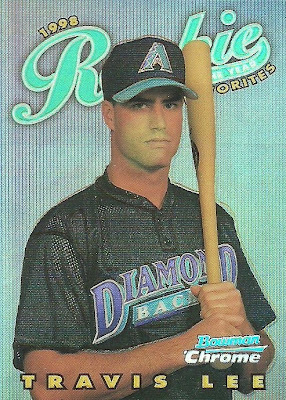 These cards are from 1997 Bowman and 1997 Bowman's Best and all feature Travis Lee. Lee was the #2 overall pick in the 1996 MLB Draft, but the Twins failed to offer him a contract in time and he was declared a free agent. 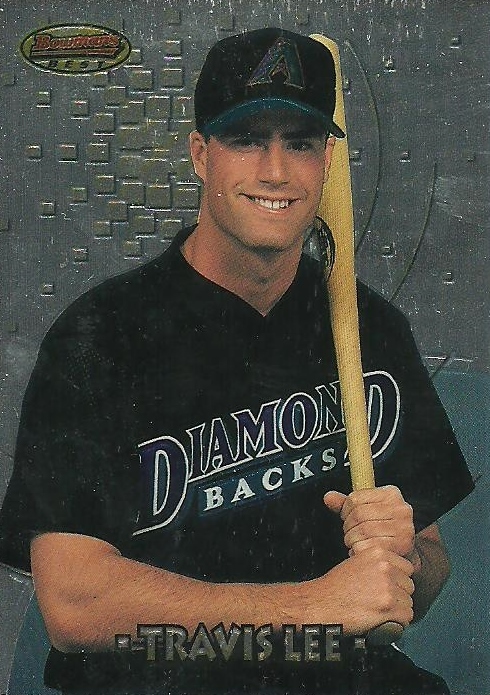 The Arizona Diamondbacks signed him to a 4 year $10 million dollar contract before the team had even played a game. I remember these cards. 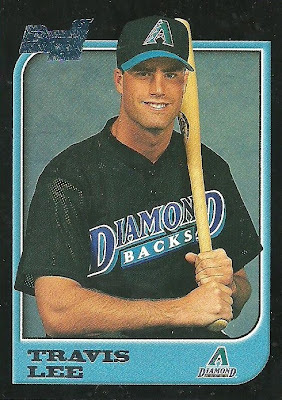 They were the hottest thing baseball card wise in 1997 in the Phoenix area and were way out of my price range. I remember them because between Bowman, Bowman Chrome, and Bowman's Best and all the inserts and parallels, there are a ton of different cards featuring Travis in nearly the same pose. Now that the cards are cheap, I'd like to see how many versions I can pick up. If you have any please let me know and maybe we can work out a trade. 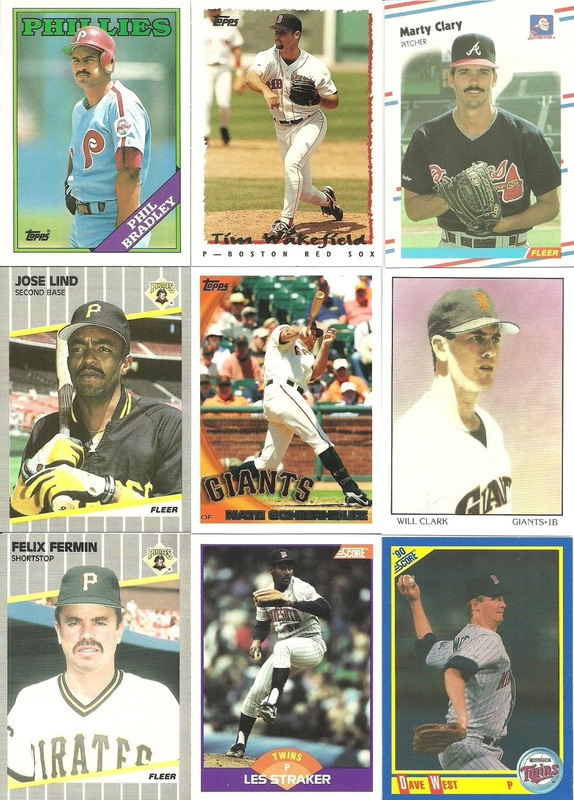 Just don't send them in a pwe. Thanks! Do I have a right to be upset? Contest Reminder - Explain Yourself!